1980's artist Keith Haring pulled from urban New York City, as well as various concepts such as birth and death, as a source of inspiration for his unique art pieces. His works of art continually utilized color and movement, working together to take on a life all their own. 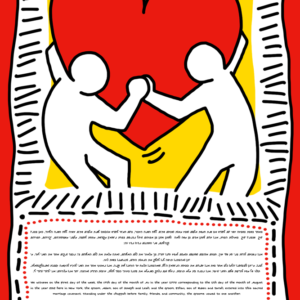 Inspired by this exciting and unique style Haring coined, The Heart Me Ketubah blends modern urban design and Ketubot tradition to make for a truly stunning work of art! With a fun design and beautiful colors, The Heart Me Ketubah contains tons of energy and romantic elements. The unique style of figures, colors, and lines creates a beautiful framing for the Ketubah text, and bring the overall design together wonderfully. This Ketubah is perfect for the couple that are searching for not just a Ketubah they love, but a work of art they are proud to hang in their home. The Heart Me Ketubah is the perfect blend of modern art, tradition, and romance. With a truly unique and interesting style, The City Streets Ketubah is inspired by the original works of art by well known artist Keith Haring. 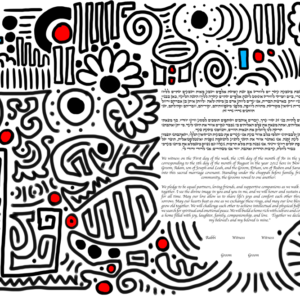 This Ketubah takes Haring's doodle-like style and combines it with the Ketubot tradition — making for a beautiful and edgy work of art! The black and white patterns work and contrast against one another while framing the Ketubah text, without taking away from the stunning art. The blues and reds bring just enough color, while embracing the minimalist style of this Ketubah. Lovers of street art and urban style will definitely fall in love with this Ketubah! This design is perfect for the couple that are searching for a Ketubah that will match their modern home and lifestyles. The City Streets Ketubah will be a beautiful symbol of not just your unique style as a couple, but the importance you both hold on tradition and commitment! Since Keith Haring first started drawing his to-be-iconic figures for the Village Voice, he quickly became a New York underground cult classic. As his style matured and his scope grew, and his figures not only represent an awesome and authentic style, but the cutting edge of New York urban cool. At least we think so. The Subway Print No. 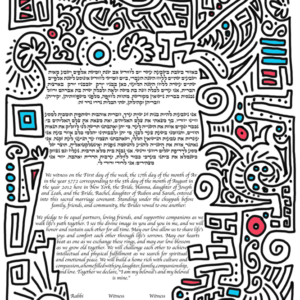 1 Ketubah is perfect for the New Yorker couple who wants a fun and modern pattern that also alludes to the classic New York cartoon tradition, and the modern activism that accompanies it.